Wisdom casting forth the Rays of Learning and Knowledge over the Island of Great Britain & Ireland and Britania on her right hand with an Angel descending to her with a Crown of Laurel. 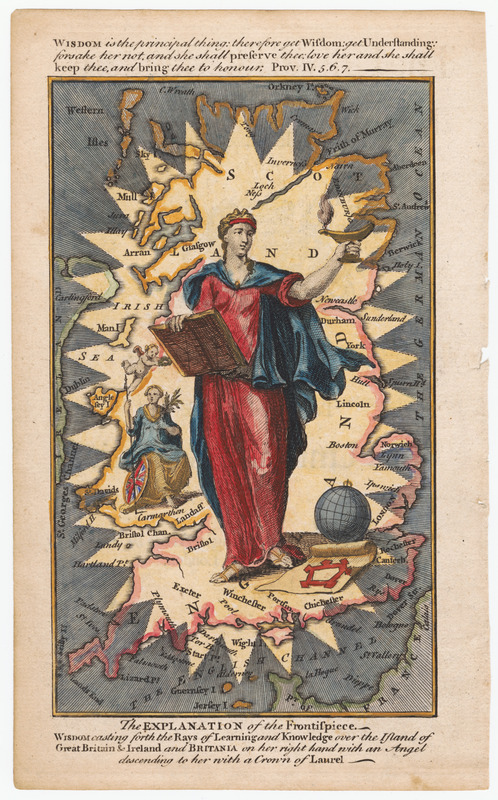 This allegorical frontispiece for the January 1749 edition of The Universal Magazine shows the goddess of wisdom, surrounded by a halo of light, superimposed on a map of Britain. Above is a quote from Proverbs: "Wisdom is the principal thing: therefore get Wisdom: get Understanding: forsake her not, and she shall preserve thee: love her and she shall keep thee, and bring thee to honour." Below is "The explanation of the frontispiece - Wisdom casting forth the Rays of Learning and Knowledge over the Island of Great Britain & Ireland and Britania on her right hand with an Angel descending to her with a Crown of Laurel." The Universal Magazine, vol. IV, no. 3, January 1749.